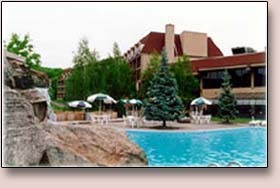 The Chateau Resort and Conference Center is at the base of Camelback Mountain Ski and Waterpark Resort in the heart of the Poconos. 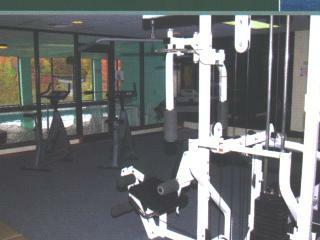 After a recent (2010) make over with all rooms and common spaces receiving renovation, this is one of the Premier Hotels or mini resorts in the Poconos Mountains of northeast PA. Designed to capture all the beauty Mother Nature has to offer, the Chateau features magnificent views of Camelback Mountain, has a cascading waterfalls on the property, and all the charm of a Pocono Mountain inn. 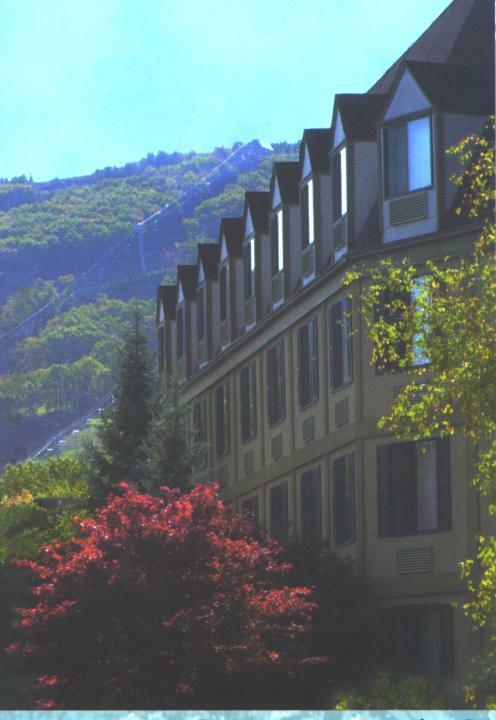 The Chateau is the closest hotel to the Poconos finest skiing, world-class water park and the adventure paork at Camelback Mountain resort. It is possible to walk the 5-6 blocks to the ski lifts or waterpark, but you will probably want to jump in the car and park at one of Camelback convenient parking lots. (We suggest the sunbowl lot ... it is right at the base of a lift and usually not full.. 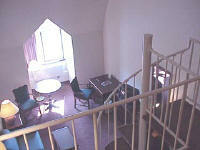 Spectacular mountain view rooms on the upper floor at the Chateau may be yours for the asking. 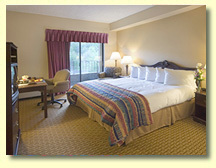 Hotel information: Garden, Mountain, and Suites. 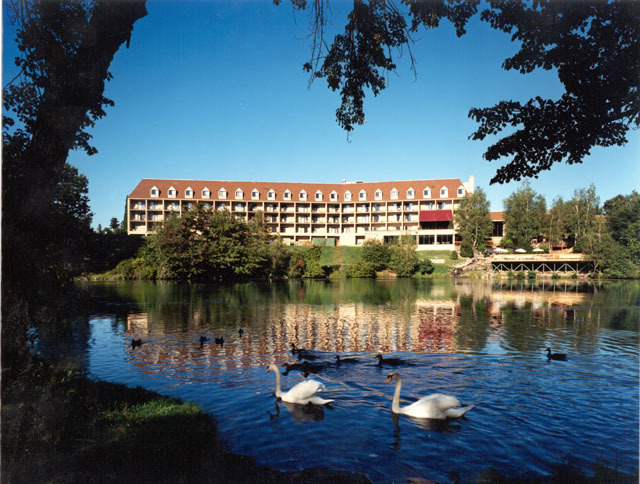 A 152 luxury-room resort with 38 bi-level loft suites, and over 10,000 square feet of meeting space with some of the finest in conference facilities in the Poconos. 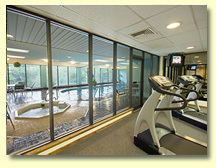 Indoor and outdoor pools, exercise room, Jacuzzi and sauna. Wedding & banquet facilities are available contact our wedding specialist. Shuttle service to the slopes is provided all winter long. The hotel and conference center were built in 1984 and renovated . 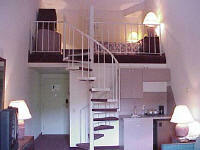 Photo of Bilevel Suite While skiing is close by, there are a multitude of other Poconos attractions within a few miles. Great shopping values are located less than 3 miles away at The Crossings Factory outlets, or take in any of the 30 area attractions. More than 20 restaurants from casual to fine dining are within a 10 minute drive. And unique shops and attractions like the American Candle Outlet, Callie's Candy Kitchen, the Pocono Snake and Animal Farm are only a few minutes drive. Policies & Disclaimers: Check-in time: 4 P.M. Check-out time:11 A.M. Guarantee Policy: All reservations must have a guarantee. 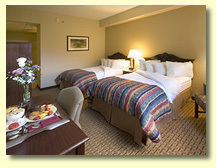 Credit card guarantee or advance deposit of one night's room and tax is due no later than 5 days after booking. Cancellation Policy: Cancel at least 3 days prior to arrival to avoid a penalty of one night's room and tax. The Bi-Level suite consists of a large sitting room with a pull out sofa bed and a second level loft, which looks down over the sitting area, accessed by a winding stairway with bedding in loft. 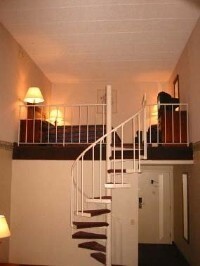 Included, of course is a full bath with shower/tub and refrigeration only available with smoking rooms..
I-95 North to I-476 North. Follow I-476 North to I-80 East to Exit 299 (Tannersville). Turn Right off the exit onto Route 715 North, to the first traffic light and turn left onto Sullivan Trail. Follow Sullivan Trail approximately 1 mile to Camelback Road (on the corner will be Barley Creek Brew Pub), and turn left. Follow Camelback Road 1.5 miles to the Chateau on the left. Follow I-76 West to I-276 West to the Northeast Extension (I-476) I-80 East to exit 299 (Tannersville). Turn Right off the exit onto Route 715 North, to the first traffic light and turn left onto Sullivan Trail. Follow Sullivan Trail approximately 1 mile to Camelback Road (on the corner will be Barley Creek Brew Pub), and turn left. Follow Camelback Road 1.5 miles to the Chateau on the left. Follow I-81 North to I-80 East to exit 299 (Tannersville). Turn Right off the exit onto Route 715 North, to the first traffic light and turn left onto Sullivan Trail. Follow Sullivan Trail approximately 1 mile to Camelback Road (on the corner will be Barley Creek Brew Pub), and turn left. Follow Camelback Road 1.5 miles to the Chateau on the left. Follow Route 22 East to Altoona to Route 220 North. Follow 220 North to Milesburg to I-80 East. Follow I-80 East to exit 299 (Tannersville). Turn Right off the exit onto Route 715 North, to the first traffic light and turn left onto Sullivan Trail. Follow Sullivan Trail approximately 1 mile to Camelback Road (on the corner will be Barley Creek Brew Pub), and turn left. Follow Camelback Road 1.5 miles to the Chateau on the left. I-95 South across the George Washington Bridge to New Jersey to I-80 West. Follow I-80 West into PA to exit 299 (Tannersville). Turn Right off the exit onto Route 715 North, to the first traffic light and turn left onto Sullivan Trail. Follow Sullivan Trail approximately 1 mile to Camelback Road (on the corner will be Barley Creek Brew Pub), and turn left. Follow Camelback Road 1.5 miles to the Chateau on the left. Follow I-84 West to I-684 South (exit 20) to the Cross Westchester Expressway (I-287). Follow I-287 Northwest to I-287 West over the Tappan Zee Bridge on I-87 North to I-287 Southwest to I-80 West into PA to exit 299 (Tannersville). Turn Right off the exit onto Route 715 North, to the first traffic light and turn left onto Sullivan Trail. Follow Sullivan Trail approximately 1 mile to Camelback Road (on the corner will be Barley Creek Brew Pub), and turn left. Follow Camelback Road 1.5 miles to the Chateau on the left. I-93 South to I-90 West (exit 20) passing Worcester to I-84 West (exit 9). Follow I-84 West to I-684 South (exit 20) to the Cross Westchester Expressway (I-287). Follow I-287 Northwest to I-287 West over the Tappan Zee Bridge on I-87 North to I-287 Southwest to I-80 West into PA to exit 299 (Tannersville). Turn Right off the exit onto Route 715 North, to the first traffic light and turn left onto Sullivan Trail. Follow Sullivan Trail approximately 1 mile to Camelback Road (on the corner will be Barley Creek Brew Pub), and turn left. Follow Camelback Road 1.5 miles to the Chateau on the left. Take Route 22 East to Route 33 North (Stroudsburg). Follow 33 north for approximately 25 minutes until the I-80 West/Bartonsville Exit (left lane exit). Continue on I-80 West and take exit 299 (Tannersville). Turn Right off the exit onto Route 715 North, to the first traffic light and turn left onto Sullivan Trail. Follow Sullivan Trail approximately 1 mile to Camelback Road (on the corner will be Barley Creek Brew Pub), and turn left. Follow Camelback Road 1.5 miles to the Chateau on the left.